On our most recent family holiday back in America, I wanted to take the kids to see the Giant Sequoias of the Southern Sierra Nevada. I hadn’t seen the enormous trees since I was a teenager visiting colleges at the end of high school. I’ve read a bit about how there is concern that these beautiful organisms may be susceptible to drought and climate change, so I figured better to squeeze them in than regret. We ended up going to Mineral King, a remote southern part of Sequoia National Park. Our main activity there was a hike up into the alpine lakes of the high country. However, we did manage a short walk through the big trees. The forest had an overstory of sequoia and sugar pine, with some ponderosa (and/or Jeffry) pine and an understory of white fir and incense cedar. By early July the forest was already quite dry, and even at 7000 feet elevation, it was still warm. It was obvious that there had been fire come through some parts of the forest- many of the firs, and some pines and cedars had been singed. The coexistence of the Sugar Pine and sequoia trees did surprise me a little bit. After all, both trees have evolved to tower over the canopy, survive fires, and reseed afterwards. It seemed a bit odd that both species would be growing side by side. However, an unrelated article on droughtproofing Australian grazing land made me wonder. Although the Sugar Pine and the Sequoia have similar above ground growth strategies, they are quite different below the surface. Sequoias have a very shallow root system, while sugar pines have a substantial taproot. 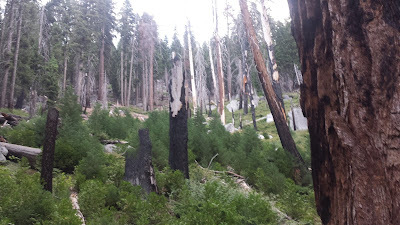 And in the most severely fire damaged areas, it appeared that the Sequoias were re-establishing best in the gullies and drainages, while the pines (sugar and ponderosa) were doing better on the more exposed slopes. Either way, the sequoias seemed to be doing just fine- old growth, secondary post-logging regrowth and saplings all seemed to be healthy. 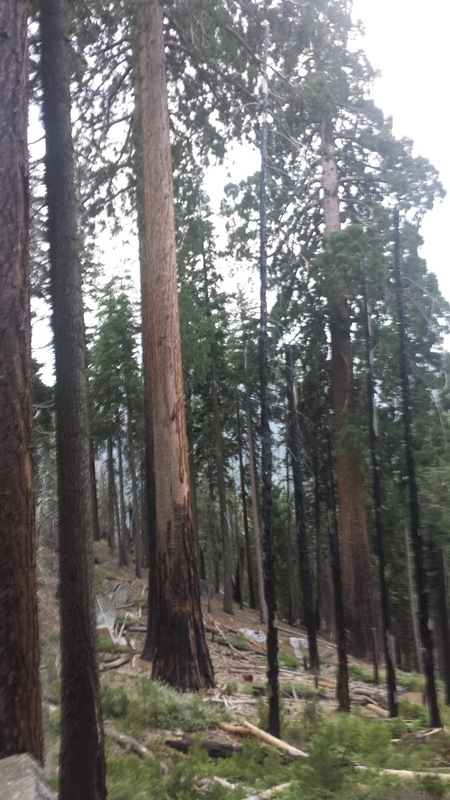 If anything, the pines seemed to be suffering worse than the sequoias.